This is the ultimate chocolate cake recipe and a chocoholics dream. Delicious soft chocolate sponge filled with a golden buttercream filling and topped with a rich chocolate ganache...and it doesn't stop there! 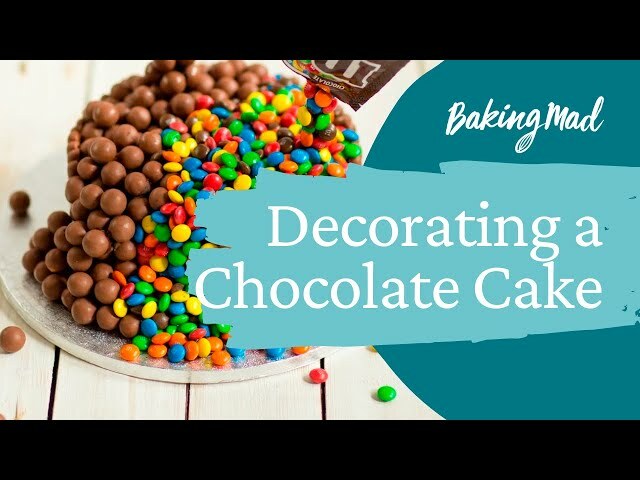 Coated with chocolate fingers and decorated with a smorgasboard of sweetie favourites this cake would be a real treat to celebrate any occasion or even just to cheer you up on a Monday! Beat together the eggs, flour, baking powder, sugar and butter until light, fluffy and fully combined. In a separate bowl mix together the cocoa powder and boiling water to create a paste, then add to the mix. Carefully fold the chocolate paste in with the cake batter until the chocolate has been fully mixed in. Pour out equal quantities of mixture into each tin then bake for 20-25. Once baked throughout, leave to cool for a few minutes in the tin, then transfer onto a wire cooling rack. To make the buttercream, blend together the icing sugar and butter, gradually adding the milk to loosen the mix. When the cake has cooled, spread the buttercream on top of the sponges and sandwich them together, leaving the top layer plain for the ganache. Save some of the buttercream to help stick the decorations to the cake. To make the ganache, place the cream and chocolate in a heatproof bowl and melt over a pan of simmering water. Remove the ganache from the heat and allow to thicken. Spread a thin cover of buttercream around the outside of the cake and stick the chocolate fingers on. Pour the ganache on the top of the cake and before it sets, add the remaining chocolate fingers to divide your cake into sections and fill with your favourite sweets. Perfect cake was really easy to make and tasted great! Not a great recipe. Followed it to the letter and it was dry and crumbly. Maybe better to weigh the eggs and proportionately adjust ingredients? And subtract the weight of cocoa powder from the flour? I’m going to try it again tonight doing just that.